Home > Switched on Thinking > Modern Marketing – Is there a place for direct mail? Modern Marketing – Is there a place for direct mail? Marketing has changed a lot over the past few years, with more and more businesses looking to take a digital approach, with the inclusion of sophisticated, low cost CRM systems and a vast array of email marketing tools now available. Direct mail is seen as becoming less and less effective. But is it actually? Would it surprise you if I were to say that in 2011, 21.9 million UK adults followed up on direct mail they had received? Or that 9 out of 10 people open direct mail (FastMAP)? I must admit, when I saw those statistics, I was exactly the same. I am and have always been the sort interested in what some describe as ‘modern marketing’, utilising social media, smart phone apps and engaging websites. But what about the view that it is just wasting paper? It is true. No point in arguing and from an Electric Corby point of view the thought of needless waste would obviously be disappointing. But is it as bad as people perceive? If we went back to 2003, DMA stats would clearly say yes. Out of all direct mail, only 13% was ever recycled. Targets set in conjunction with Defra were put in place to tackle that. By 2009, it was hoped that 70% would be recycled. In fact, that figure was actually higher than expected with 76%. To put it into perspective, less than 1% of everything in a landfill is direct mail. But clearly there is room for improvement and hopefully this upwards recycling trend will continue its’ momentum. The inspiration for this article is that we have recently been promoting one of our up and coming events and when we looked back at previous successes, we could see a positive impact to web traffic off the back of direct mail. This then got me thinking about the numerous debates going on about the effectiveness of direct mail as well as the environmental impact. Going back to the main debate though, is there still a need for direct mail? The answer is, it all depends on your business. From experience, different people respond differently to different messages and different media. Some would respond better to emails, some to radio adverts, newspaper adverts or even direct mail. Depending on what you are advertising, you may see more success through different channels. The answer is, there is no one right way of marketing. You can have all the statistics in the world and analytical reports but you can rarely truly know a customers journey. We ask customers or visitors how they heard of us. The general answer is usually, website! Why is that? That is generally the last place they went to before they engaged. Does that mean the website is the only thing we should invest money in? Of course not! How did they end up on our website? Yes some may have typed in a relevant term into Google and stumbled across us. However, some may have ready a newspaper advert and searched for us online. Some may have heard our name in conversation after seeing our big inflatable dome in the town centre. This is the same for any business. Gauging the customer journey will always be a challenge. To actively capture as big an audience as possible, each business should look to promote themselves in as many different channels as they deem relevant. Some will work and some will not. It will become apparent quickly which channels need the most investment. But even if you do spread yourself over lots of different channels, that wont guarantee success. To be successful in marketing you need to know your audience, know why they are likely to engage with you and know what benefits you will be able to offer them. Once you know that, you will be able to accurately define your messaging. Once you know your messaging and your audience, you can accurately design yourself (or through a second party) the look and feel of your material. This is when direct mail can really come into play. Have something that stands out and is against the norm and you can actually have some striking examples of great marketing. 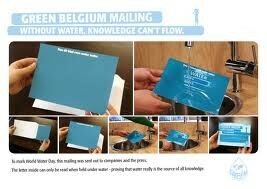 One that really stood out to me was a mailer about World Water Day. The idea was unique and in my opinion genius. The mailer was asking businesses to participate in World Water Day. However, the message could only be seen if it was held under water. Now obviously there is the irony of World Water Day being about reducing water usage and this was encouraging it but the campaign proved to be really successful. To me it proves that is you spend enough time thinking about what you want to get across, you can come up with some truly innovative ideas. So is there room for direct mail in modern marketing? To me, the answer is a simple yes. The opportunities to innovate and stand out are ever increasing and the call to action is proven to be pretty high. Plus, thanks to several changes to policy on recycling, it is not as damaging to the environment as you may have first thought. I won’t be discounting direct mail any time soon and there will be a place in my marketing mix for investment in this. Will there be in yours? Join the debate. We will be running a workshop in modern marketing in the next couple of months. If you want to get involved, email us to register your place at [email protected] or call 01536 560222.